Oh dear. Oh dear oh dear oh dear. Just take that vintage technology away, please! Right. Last night I wrote about 8-track tapes, a vague part of my 1960s and ’70s childhood at the Manse that were, in my opinion, pretty close to the worst technology ever. Certainly the worst music technology ever – though the interesting folks at a site I linked to in that post, 8-Track Heaven (“If we don’t care for the 8-track, who will?”), might disagree. 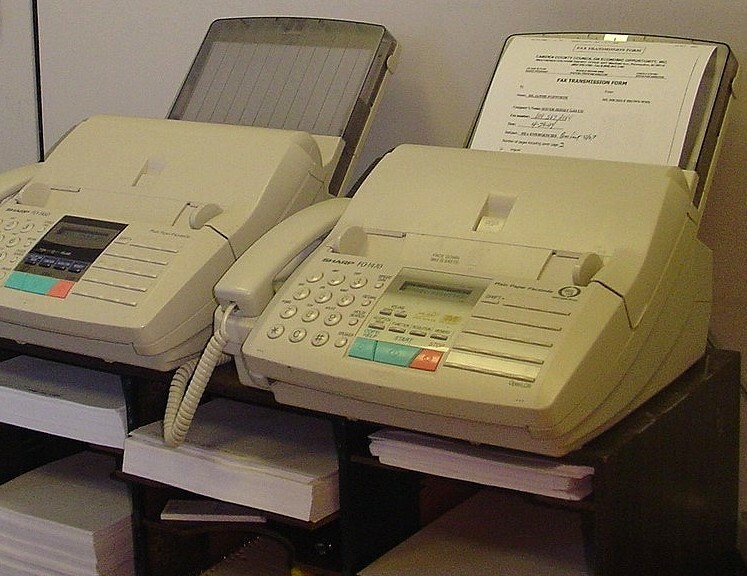 So this evening as I was enjoying my weekly read of the Tweed News – catching up on the goings-on at the Chapman Women’s Institute and the winners at the weekly euchre party, among other things – I came across another entertaining reminder of technology that has mercifully faded away: fax machines. Remember those? I mean, I know most of us do still occasionally have some connection with a sent or received fax – for instance, in my experience the medical community is still unaccountably attached to faxing, for things like prescription renewals and whatnot – but really, when most people (including doctors, if they actually tried) can scan a document on their printer and email it on their computer, who needs fax machines? I guess this is kind of a “Fax Machines for Dummies” from back in the early days. 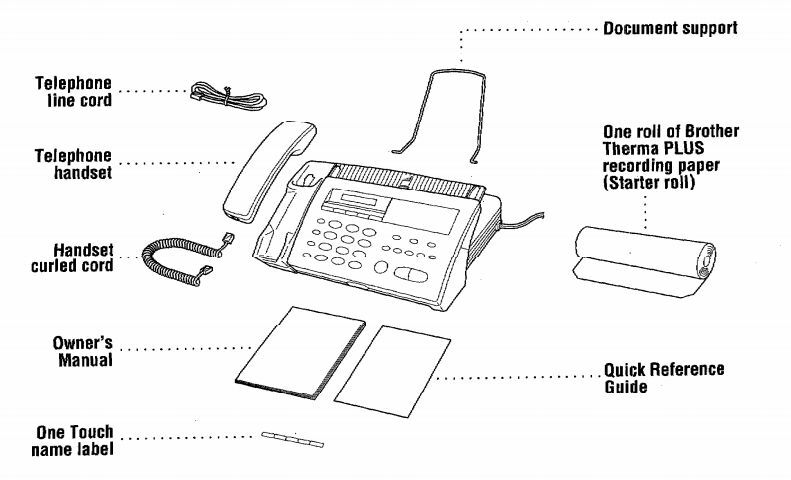 Note the roll of “thermal paper” on the right – remember that godawful slippery paper that you couldn’t even put in the recycling bin when you were done with it? One of my recent thrift-shop finds was this: a reminder of misguided technology (and a hugely popular pop singer) from my youth. I have no way to play it, but given how awful 8-tracks were, who’d want to? So how long has it been since you thought about 8-track tapes? Now, I realize that if you’re below the age of 45 or so you probably have never thought of 8-track tapes even once in your life. But if you’re older than that, you certainly know what I’m referring to. And I suspect I’m safe in guessing that when you recall 8-track tapes, you do so with a shudder. Because they were surely the worst technology ever invented. Not only were they big and ungainly – unlike those sleek cassette tapes that came along shortly after them. And not only were they, well, tapes – which meant that the tape could, and did, get tangled and mangled. The best (by which I of course mean the worst) thing about 8-track tapes was that their four tracks, or channels, or whatever they were called (why did they call them 8-tracks when there were only four of those thingies?) apparently had to all be exactly the same length. Which meant that if a song that started on one track, or channel, or whatever it was, was a little long, the stupid thing would hiccup and stop and switch to the next track – right in the middle of the song! Anyway, 8-track tapes and tape players were an inevitable part of my 1970s childhood, and perhaps yours too. Thank goodness better technology came along and relegated them to the dustbin. So I find it a little funny that I’ve been reminded of that deservedly almost-forgotten technology not once but twice in just the past few days. 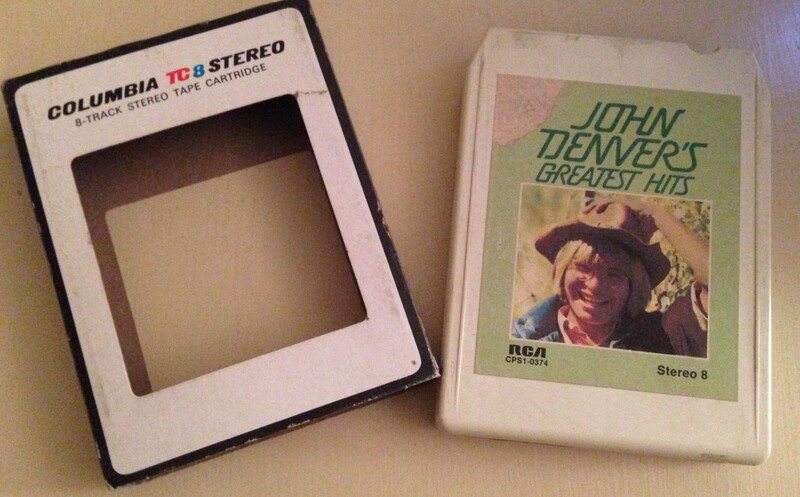 The first time was last weekend, when I popped into Hidden Treasures, the thrift shop on the main street of Tweed, and spotted a whole box of those 8-track babies, with John Denver’s Greatest Hits right at the top. John Denver was (as you will know if you are over the age of 45) hugely popular in the early to mid-1970s, and those songs remind me happily of my early teenage years here at the Manse. And the fact that it was in 8-track format? Well, that just made me laugh because of the stupidity of the thing. For a quarter, I figured it was well worth it to have a little reminder of that wildly misguided technology. I guess there’s a lesson in that lovely passage. To wit: even from bad technology can come splendid lifelong memories. That’s kind of cool, actually. 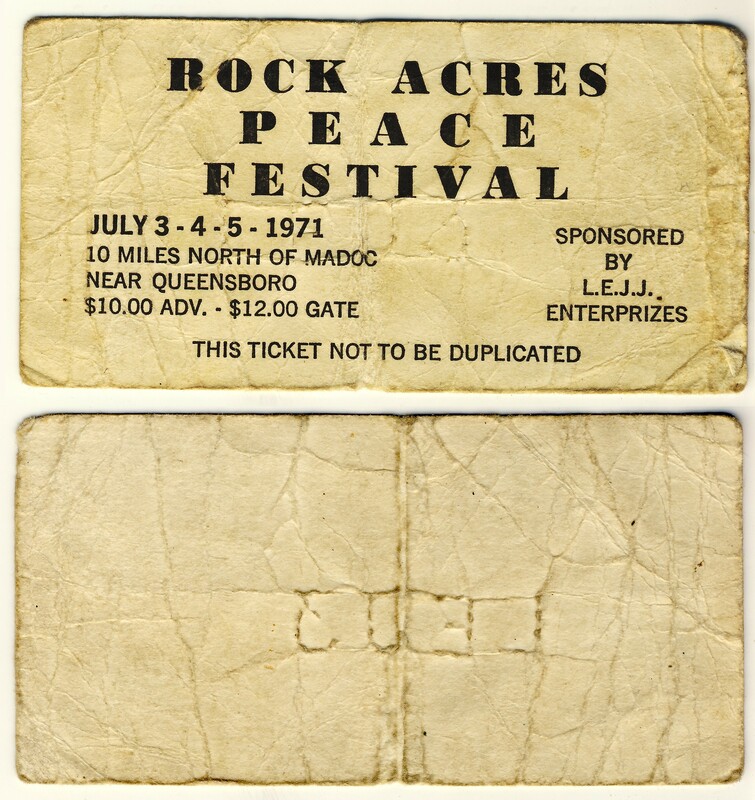 Bert’s original ticket (front and back) from the 1971 Rock Acres Peace Festival held “near Queensboro.” And with it comes a wonderful reminiscence of the event from Bert. Read on! I know that I do go on about how tremendous it is when readers share their stories and information about Queensborough (and renovating Victorian homes, and snowblowing, and whatnot) here at Meanwhile, at the Manse. But please humour me, because I’m about to do it again. The other day a comment came in on one of my posts from last August about the Rock Acres Peace Festival, the Woodstock-like event that put Queensborough on the map way back in the summer of 1971. And since many readers probably don’t see all the comments, especially comments on long-ago posts, and most especially because this one contained such a spectacularly great story, I am going to share it with you right here. Having recently turned 17 years old and with my parents away for the summer, it was a fantastic time for a middle class, teenage boy from the Toronto suburbs to have aspirations of being a hippie. As I recall, the local radio station, CHUM FM, talked about the Rock Acres Peace Festival from about June or so. Several of my buddies and I planned to go but I don’t remember if we got tickets in advance. 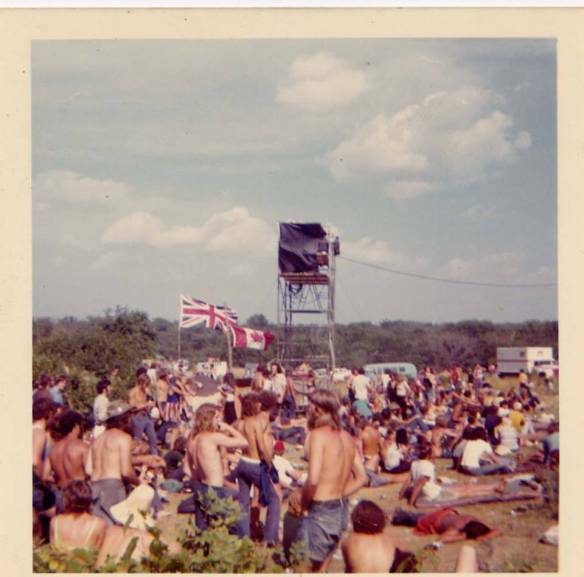 As the July dates were postponed to August, this was going to be my second outdoor, weekend music festival of the summer as we also went to Rockhill ’71 in Mulmur Township, northeast of Shelburne, on July 2-4. Once we got to Queensborough we made a grocery run to one of the general stores. I remember thinking how cool is this place, especially compared to suburban Toronto. Lots of our types of people milling around. We met up with about 8 other of our Toronto friends when we got to the festival site. Funny how little recollection I have of the festival site, the layout and the bands. Even the photos on your blog didn’t help. Another buddy and I reminisced and even he can’t remember. We do remember the bikers, and actually keeping away from the stage area because of them. That being said, it was a pretty cool weekend. Rumour has it, that it may have had something to do with our partaking, several times actually, in the use of alternative methods of exploring the sensory and psychological world around us. To this day, the Saturday night of the weekend holds one of my best memories. It was late at night, the bands had finished, the bikers were calmed down, it was fairly quiet, we were sitting around our fire, and I was lying back on my sleeping bag looking up and enjoying the night sky and the stars. Not far away, coming from someone’s 8-track tape player, came the Rolling Stones song Moonlight Mile. I was, and am, a huge Stones fan to begin with, and that song was already a favourite of mine. But that night, in that atmosphere, under those conditions, the song was sublime. Anyone who knows the song, with Mick’s voice alternating between singing and sighs, the last minute and half gradual build up of guitar, piano and strings to the exquisite finish, can appreciate what I mean. It was transcendent. As mentioned, to this day when I hear Moonlight Mile, I close my eyes, think of that night and remember how special it was and how lucky I was to live in and be a product of those times. We left the next day, tired, hungry, dirty but happy. It was a fun 3 days at the Rock Acres Peace Festival and in Queensborough. My buddy and I may have to do a road trip back this summer. Hey Bert, what can I say but: Thank you for taking us all on your journey back to that splendid time, right here in our little Queensborough – and do come back for a visit! 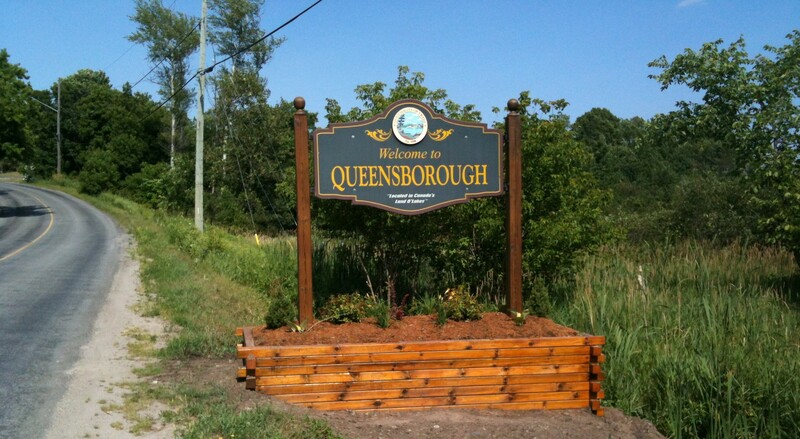 “Welcome to Queensborough,” our sign proudly says. But I have a dim memory that in my childhood here the sign said “Queensboro.” Why? Read on. 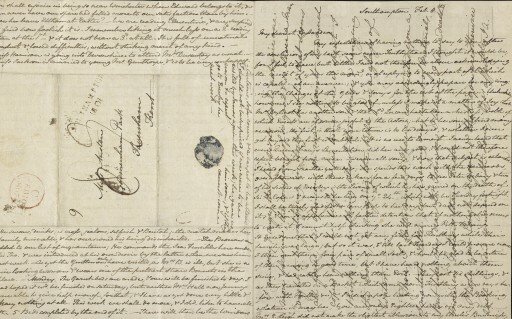 Reader mk posted a comment on my most recent entry about local place names in which she raised an interesting question – and brought back some long-ago memories for me. 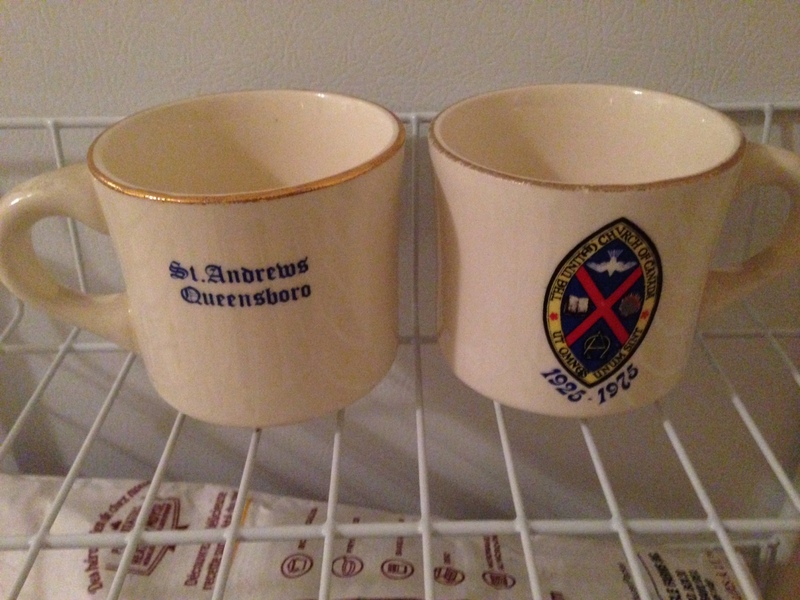 From my apparently bottomless supply of local artifacts: two mugs produced to celebrate the 50th anniversary of the United Church of Canada – naming “St. Andrews [sic] Queensboro” specifically – in 1975. Which would have been fairly close to the end of the period of the “Queensboro” spelling, I think. Well, I think I can answer. Back when I was a kid growing up here at the Manse, lots of people spelled the name of our village “Queensboro” – and in fact I am pretty sure it was considered the standard spelling. But in those days people also often wrote “Peterboro” for Peterborough, and “Scarboro” for Scarborough, and so on. And what was that all about? And those were also the days when it was very common to see people’s first names shortened: “Geo.” for George, “Chas.” for Charles, “Jas.” for James, “Thos.” for Thomas. When was the last time you saw that? Probably in a newspaper from no later than the very early 1960s. But again, it was probably done to save space: if you were, say, Thomas A. Ross, shoeseller of Madoc, Ont., and wanted to advertise your shop in newspapers (and on matchbook covers, like here) you would save a bit of newsprint and ink – and thus money – by shortening your name to “Thos.” And so that’s what people did. I know of at least one Ontario place not so far from here that has held onto its “boro” spelling, even as Peterborough and Scarborough and, yes, Queensborough have long since become commonly known by their full – and, let it be said, correct – names. That would be the village of Reaboro, the Lindsay-area home of my aunt and uncle where my four cousins grew up. I have to say (and I think my cousins would agree) that I think “Reaborough” would look quite weird. But Queensborough? Now that’s one distinguished-looking name! 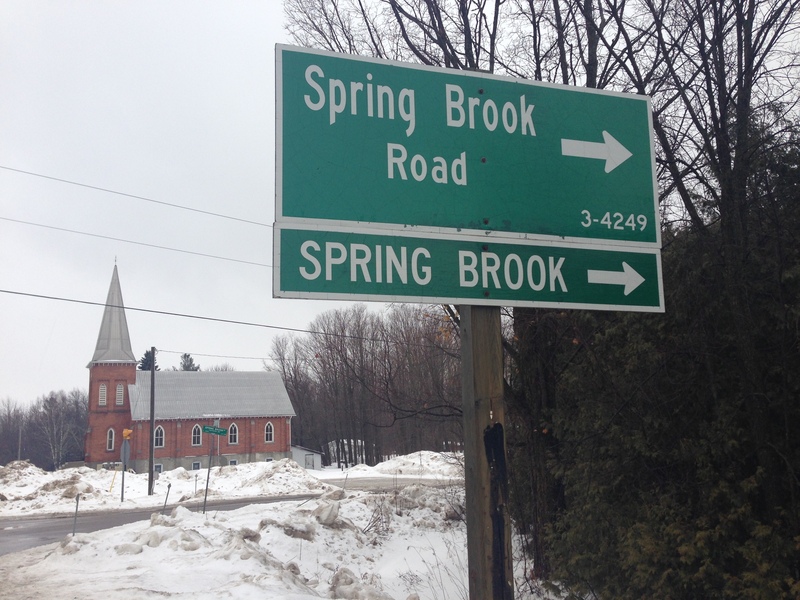 Springbrook or Spring Brook? Which is it? 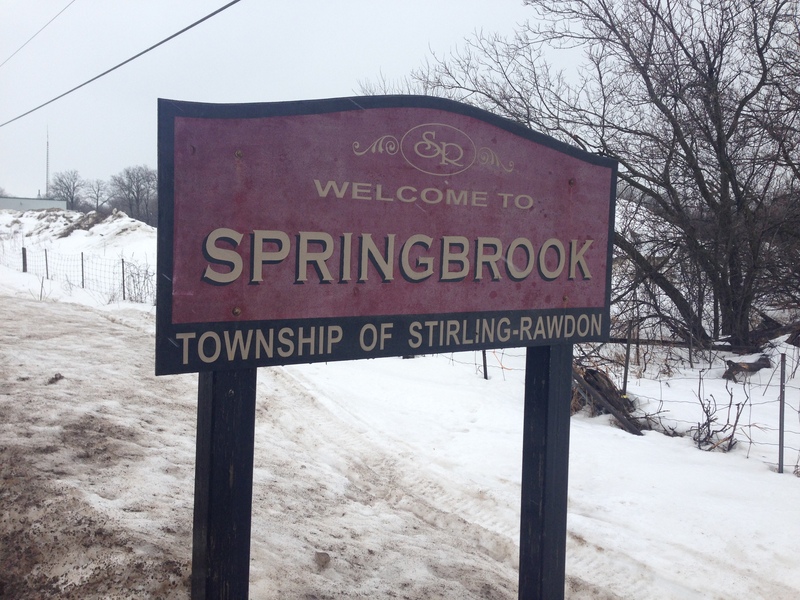 I couldn’t believe my eyes when, upon returning to central Hastings County where I’d grown up, I discovered that the village of Springbrook had been rechristened “Spring Brook.” Or had it? 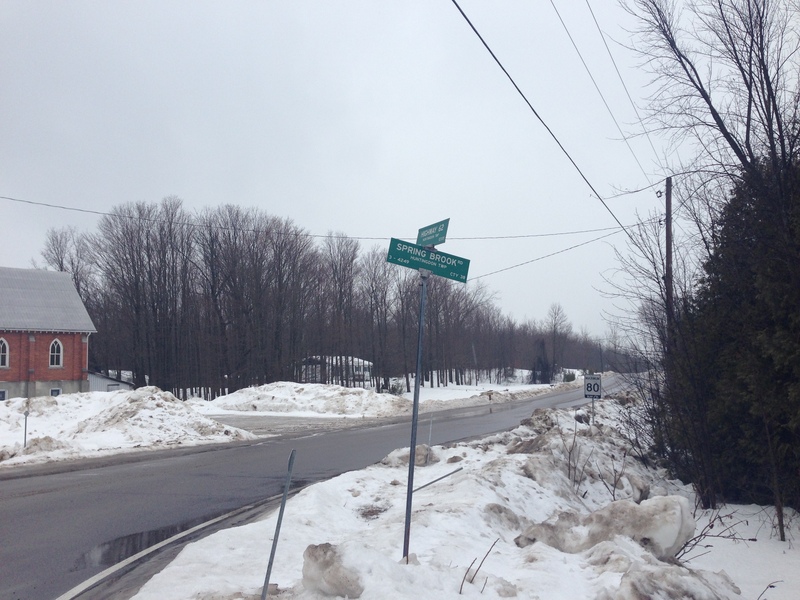 Thanks so much to all of you who weighed in on the debate over how to pronounce “Kaladar” and “Moira.” To follow it all up, we have another glimpse into placename oddities here in central Hastings County. 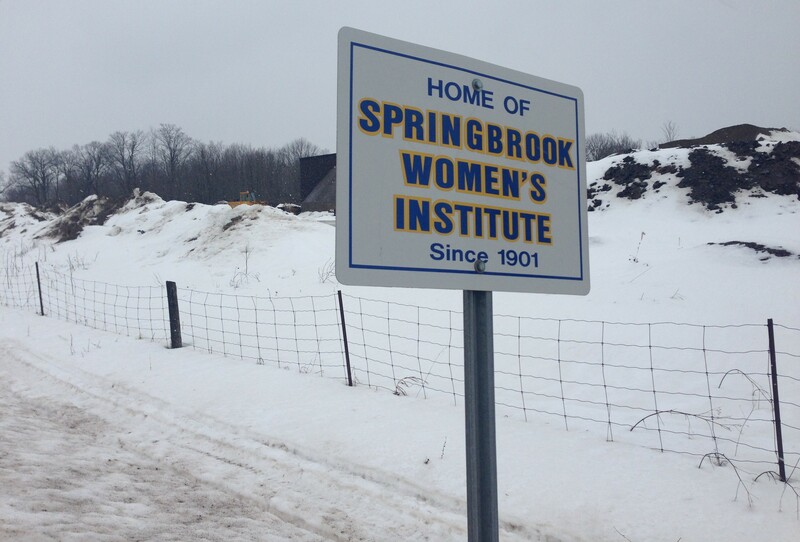 It is: The Curious Case of Springbrook. Or is that “Spring Brook”? Make up your minds, people! So which is it, do you think? 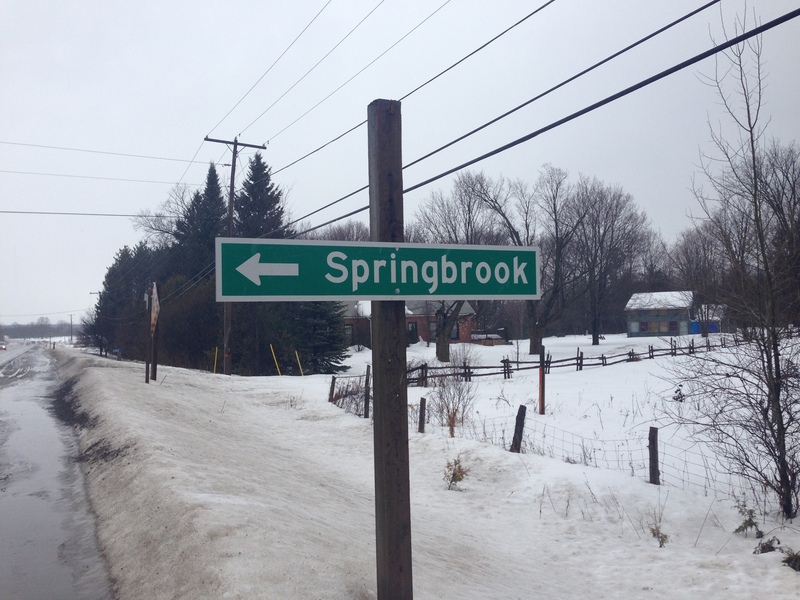 Springbrook or Spring Brook? Well, I have two final weighty arguments, one for each side of this thorny issue. Drat! Check out the address at the top! People, if you can’t trust the Women’s Institute to get it right, who can you trust? Is it KALadarr or KalaDAYRE? MOYR-a or Moe-EYE-ra? 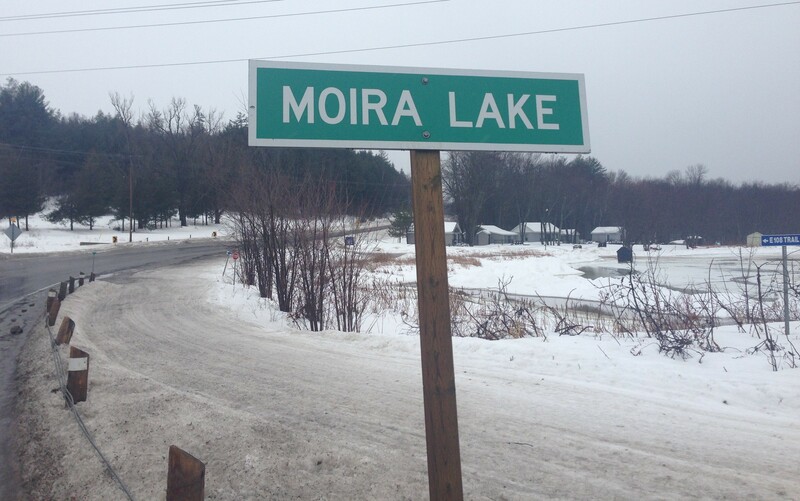 Name that lake: how would you pronounce “Moira”? Because I’m interested in language, I tend to pay attention to the way people speak wherever I happen to be. Accents and regional dialects and pronunciations fascinate me. And the Hastings County/Eastern Ontario/North of 7 region where Raymond and I now live does not disappoint when it comes to regionalisms. While there’s lots to report on that subject, tonight I thought I’d stick to the variations in pronunciations of some place names. 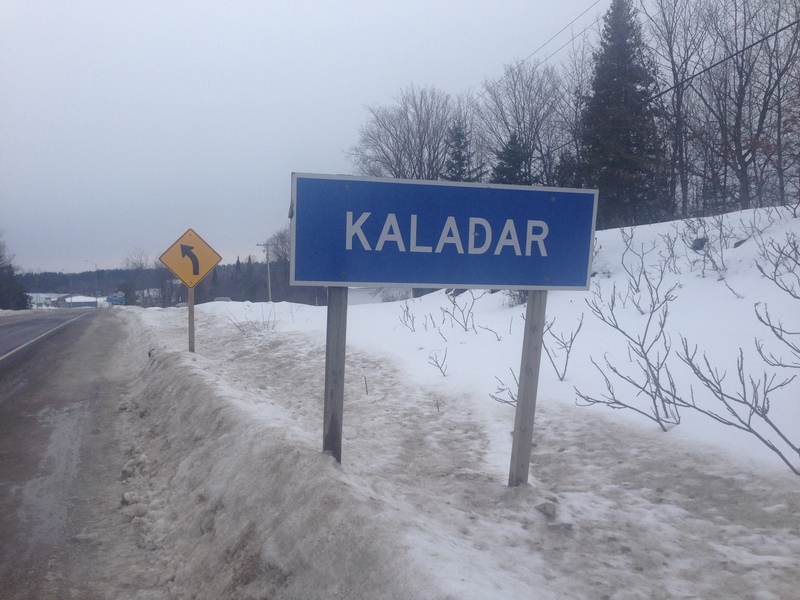 One such variation that I remember well from my childhood growing up here at the Manse in Queensborough was how people pronounced the name of Kaladar, a village about 25 miles to the east of us on Highway 7. Some people said “KALadarr (with the emphasis on the first syllable and the “a” in the second syllable short like the a in “cat”), while many others said “KalaDAYRE” (with the emphasis on the final syllable and the “a” long like in “care”). According to the rules of English pronunciation it should be the former, but in my experience the latter pronunciation is more common, most especially among those who have lived in the area all their lives. Because, you see, the dichotomy in pronunciation wasn’t just back in the years of my childhood; upon my return to this area, I have discovered that it very much still exists. Interesting. And then there’s a very common name, Moira. In central/south Hastings County there is a major lake by that name, and a major river, and also a hamlet. My unscientific research has reached the conclusion that it’s about half and half between those who pronounce Moira as MOYR-a and those who say Moe-EYE-ra. Me, I go for the former, but what does that mean? Who’s to say which is right and which is wrong? Because it’s all part of the local colour, isn’t it? Life would be rather dull if we all did and said things the same way. Including how we pronounce the places around us. My latest vintage kids-series finds. But who, pray tell, is Polly French? Why did I want The House on the Cliff? Because another reader, Sash, had mentioned that it was a (sorry, can’t resist) cliffhanger that had been a particular favourite of his when he used to check out mystery books for kids from the Madoc Public Library in his Madoc youth. I read a fair number of Hardy Boys books myself once upon a time, but can’t for the life of me recall anything about The House on the Cliff, so I think it’s time I looked into it. I trust Sash’s recommendation. But of course, bibliophiles that we are, Raymond and I did not manage to get out of Country Treasures with just The House on the Cliff. No, we succeeded in digging up books from three other series written for early teens way back in the day. Raymond’s find was Spin and Marty, which I have to admit I had never heard of. Apparently Spin and Marty were two lads who lived – and doubtless had many adventures – on a ranch, and Raymond used to read the books (which ended up as a Disney TV series) back in his youth. “Hadn’t thought of Spin and Marty in decades,” he announced. All the more reason why getting one of the books for $6 (less the 10-per-cent discount that’s in effect on the antiques at Country Treasures till the end of February) seemed like an exceptionally good idea. 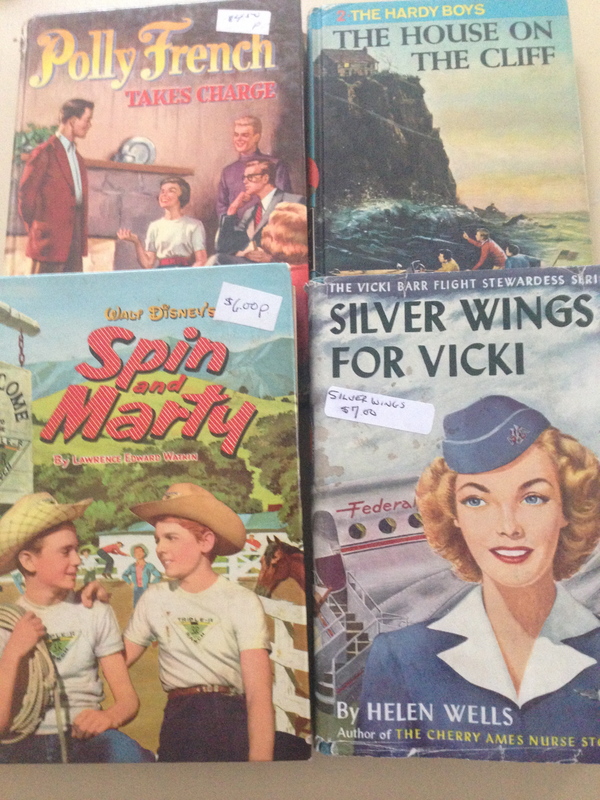 As for me, I found one from a series I loved as a kid, the Vicki Barr books – about a young woman who becomes a stewardess (as they called the job in those days), and had all manner of adventures in that line of work. And finally, I found Polly French Takes Charge, which intrigued me because it looks like yet another series – and I know nothing about it. I’m kind of guessing, from the cover and inside-cover illustrations, that it takes place in a high school. Could Polly French be a plucky young starting-out teacher, just as Vicki Barr was a plucky young starting-out air hostess and Cherry Ames a plucky young starting-out nurse? And Nancy Drew a plucky young amateur sleuth? If so, call me crazy, but – I think it rather likely that Polly will be having some adventures!